Thanks to Tyler, I’m spending the morning listening to archival folk music recordings and grinning from ear to ear. 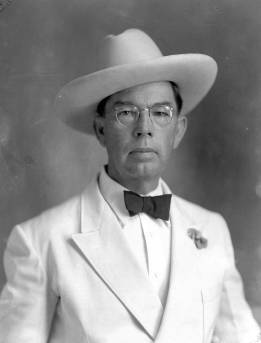 I’ve written about cousin Bascom Lamar Lunsford before. In the years since the CD reissue of the Anthology of American Folk Music, which features several of his songs, quite a few folk artists have approached his tunes anew, with varying levels of success (check out Frank Fairfield’s version of “I Wish I Was a Mole in the Ground“). But nothing’s like the real thing. So I was thrilled to get a link from Tyler on Facebook pointing me to the digital archives at Berea College with a collection of forty-two Bascom Lamar Lunsford archival recordings, plus a few large group songs and a newsreel, available for free listening and download. The quality of the recordings, made for Columbia University in 1935 and archived by Berea, isn’t great — there’s reel-to-reel noise on most of them, and the otherwise revelatory performance of “Mole in the Ground” is marred by uneven recording or playback, leading the pitch to wander all over. But hey–free Bascom Lamar Lunsford! Go listen! More reading: a Bascom Lamar Lunsford/University of Virginia/Virginia Glee Club connection. This mix has been percolating a while. I didn’t know how to move beyond Jeff Buckley’s absolutely epic reading of his lament for his dead father, but it turns out that anger works remarkably well when played against grief and loss. And that’s how the rest of the mix went. I make no apologies for the elegiac (some would say self indulgent) triple punch of the Death Cab, Cure, and Jane’s songs stacking up all together. Somewhere there is a sixteen year old who’s just broken up with his girlfriend who only wishes he could put that much misery together in one place on the mix that he’s going to send her. Bascom Lamar Lunsford’s a cappella version of “To the Pines, to the Pines” is both more matter of fact and more chilling than the version by Leadbelly (and the bloodcurdling Nirvana cover it inspired). The Virginia Glee Club in concert at the 1947 Virginia Music Festival. We’ve visited the Virginia Glee Club during their spa years in the 1930s, but what was the group doing in the 1940s? Part of that history, the group’s participation in the creation of Randall Thompson’s “Testament of Freedom” (dedicated to the group and composed in honor of Thomas Jefferson’s 200th birthday), is well documented. The postwar years find the group in a variety of settings, including preparing for the first Songs of the University of Virginia recording, but little is documented publicly except for one concert appearance at the inaugural Virginia Music Festival. The Virginia Music Festival was started as an “experiment” in musical performances in the state–a non-profit organization bringing “the best in music to the Old Dominion.” Its founders included Dr. Meta Glass, president of Sweet Briar College, and Edward Stettinius, Jr., UVA alum, former secretary of state, and then-rector of the University. Performances were hosted in Scott Stadium at the University. 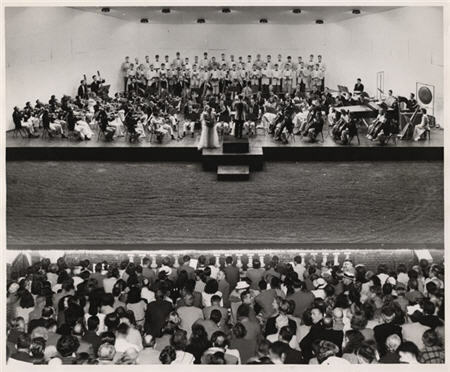 In its first year, 1947, the “best in music” was three performances by the National Symphony Orchestra. In subsequent years, there were school band competitions and folk musicians (the latter program curated by none other than my distant cousin Bascom Lamar Lunsford). In 1949, its cofounder Stettinius died of a coronary thrombosis at the age of 49. After 1950, the Festival was no more, at least in this incarnation. It’s tempting to imagine the Virginia Music Festival as a possible Southern incarnation of the Tanglewood Festival, but its small scale, lack of a permanent orchestra in residence, and lack of a musical education component render it just a curiosity of history, albeit one in which the Glee Club was involved. The photo above shows the Glee Club, resplendent in summer whites, on a temporary stage behind the NSO, accompanying Mona Paulee of the Metropolitan Opera in Brahms’ Alto Rhapsody. Unlike the northern glee clubs, the Virginia Glee Club did not often collaborate with major symphony orchestras (due in part to proximity issues), so this has to be counted as a high point in the group’s mid-century artistic history. In fact, between the association with Randall Thompson, this event, and musicologist Stephen Tuttle’s involvement in directing the group, this period was a high point overall in the group’s musical renown. Five years later Tuttle would be gone to Harvard University (and in eight he would be dead), and the group’s focus would be narrowed, for a while, to University audiences. But the best part is that it’s a connection back into the county where my father was born and where his family was from, for as long as anyone can remember. Bascom is distant kin, and getting to hear him speak on this introducing the tunes as he recorded them for the Library of Congress in the late 1940s is spine-chilling.